What kind of journey can you go on when you aren’t in control of any of the destinations? And what if you were grappling with that while trying to find your family? Such is the conundrum that agoraphobic Peri (short for the oft-disused “Hesperia”) faces in The Far Meridian, the second podcast produced by The Whisperforge, an audio fiction collective dedicated to showcasing underrepresented and marginalized voices. In The Far Meridian, Peri tries to find her missing brother, while living alone in a lighthouse that appears in strange places at the setting of each day’s sun. While other serialized fiction stories might focus on a foregrounded plot driven by characters’ actions, The Far Meridian is more akin to a series of vignettes; both the subtle underlying plot thread and the impacts of Peri’s actions are diffused across many episodes. These vignettes give us a glimpse at Peri’s personal growth, with each episode featuring Peri and frequently her companion Benny meeting people wherever the lighthouse has brought them. The people they meet are typically a little unusual and out of place, but ultimately, they’re the kind of folks you could find on TV, in the news, or just by walking down the street and turning the corner. It’s this structure and conceit — originally based on monologues written by the show’s creator, Eli Barraza — that gives The Far Meridian its dreamlike sense of place. Every visitation is a self-contained exploration to a place whose logic isn’t quite of our world, with new rules and considerations. But despite being depicted through a layer of surrealism, every location — whether it be a church, a swamp, Mars, or a neighbor’s house down the street — is made recognizable and mundane, with whatever oddness that lingers upon it left unexplained. Even the very nature of Peri’s traveling lighthouse is left up to dream logic. In this way, The Far Meridian could be placed under the large, somewhat nebulous umbrella of magical realism. A literary genre originating in works of post-colonial Latin American literature, magical realism often features ordinary settings transformed by layers of fantastical elements. More centrally to its creation, however, the genre was used in Latin America as a tool to comment on and critique authoritarian regimes, classism, and socio-political oppression. Indeed, many magical realist authors fled their home countries for their political activism and ended up writing their fiction from foreign countries. Their fictional worlds exist at the intersection of their lived experiences and their political ideals. 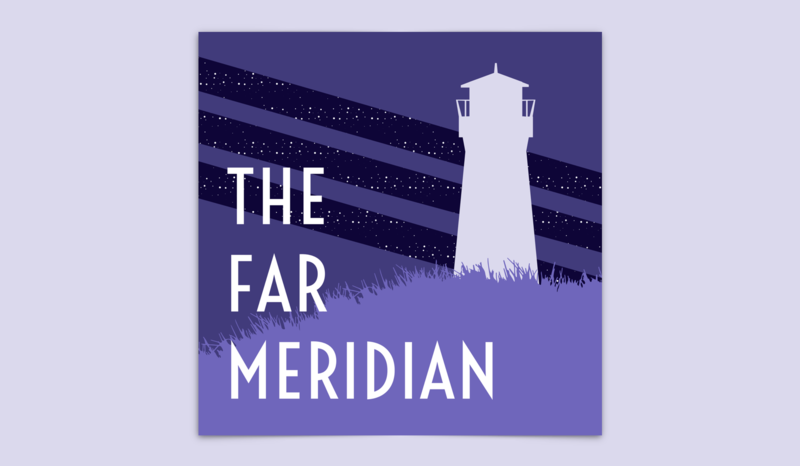 Eli Barraza has spoken about The Far Meridian’s relationship to magical realism, citing the genre as a source of inspiration, especially in making it feel in the podcast like there’s always magic just around the corner. However, Barraza draws upon other genres, too; and so putting The Far Meridian under any one category is like explaining the magic behind the lighthouse — unnecessary, limiting, and perhaps ultimately inaccurate. Undoubtedly, the show touches on the effects of colonization. Peri is a Latina who cannot fluently speak Spanish, and she feels deeply disconnected from her heritage. And the episode “An Innocent Fly” grapples with strangers walking into a new community and treating it with disdain. As Barraza herself was raised and became fluent in a culture in which magical realism is such a powerful tradition, it isn’t surprising that such aspects filter into her work. Still, these themes are not at the center of her fictions. Instead of worrying about what tenets or genre conventions her podcast should or should not follow, Barraza’s work primarily focuses on character, emotion, and what it means to grow. This is the understated strength of relying on vignettes: they serve as mirrors to emotions and experiences that are relatable to listeners, and are often those that Barraza has in some way intersected with herself. Peri is not an impulsive or high-action protagonist. Instead, she spends time thinking, taking her time, figuring out puzzles, people, and, eventually, herself. The Far Meridian is all about people, their perception of their circumstances and the world around them, and the way those perceptions create emotion. Such a focus would not be possible without expert sound design, and here Mischa Stanton exemplifies what it means to have a deep understanding of place and emotion using audio. Every episode knows what it means to be somewhere else: the hiss of a swamp, the echo of an empty church, the bustle of a market festival, the clinking of a nighttime diner. These environments are the kind of archetypal silhouettes we expect from dreams: identifiable yet distant, they become part and parcel of the experience. It should be said, however, that these soundscapes would not be complete without Juliana Parker’s music. Parker’s composition breathes a necessary level of emotion into The Far Meridian, which is crucial, given that music — as Barraza has stated — can often express emotions better than words. Parker’s music points us toward so much: mood, nature, duplicity, humor, tone. And especially in The Far Meridian’s second season, music is a central to understanding Peri’s character and the way she moves through the world. The music’s evolution throughout the season, including the way it’s talked about, are neon signs pointing towards a cohesive arc across the vignettes: Peri’s identifiable growth as a person. The change we witness in Peri between seasons one and two can be found in the way she helps others in “Defrag,” the way she helps herself in “The Festival,” and the way she handles the loss and discovery of music in “After” and “The Abandoned Olympian.” Peri becomes a guide for the listener in exploring these off-kilter locations, even while requiring her own guides: Benny, her childhood friend Ruth, many of the characters she meets, and of course, the lighthouse itself. The changes we hear Peri undergo are both fulfilling and grief-ridden as she comes to terms with her past and how it has impacted her present, which has not always been dealt with in a healthy manner. The guides in this dreamy wonderland keep the magical from feeling too far out of reach, and are core to showcasing that, whatever else, The Far Meridian is rooted in the real — real people, real emotions, and real growth. Elena Fernández Collins (@ShoMarq) is a podcast critic and linguist. You can find more of her work at The Bello Collective, The A.V. Club’s Podmass, and The Podcast Host.